I have a standard GCB-95 Crybaby Wah that's been working great for years.. then all of a sudden it's got issues. It works fine when bypassed/disengaged, but puts out no sound at all when clicking it into wah mode. These symptoms first started last night. When I woke this morning I tried it out, and it was running like a well oiled machine. I took a break for an hour or so and when I returned it wasn't working again. I've been messing around with all the possibilities.. bad chord, bad battery (I don't have the 9V power supply/wall wart), bad guitar, etc. Everything minus removing the circuit board and nothing helps. Anyone out there familiar with this problem and how to fix it? Or some suggestions on troubleshooting that I haven't touched on? Have you opened it up to check for any loose wires? I could be the switch too, you would need to check for continuity with a multimeter to see if it works properly. If you don't maybe a friend has one? Dirk wrote: Have you opened it up to check for any loose wires? I do have a multi-meter, but just for rare cases like this, so I'm no familiar with how to set it up. And then I'd need a schematic to find out where I need to touch with the probes. Also, I always thought that my Crybaby was one of the more recent versions, with the embedded circuit boards. However, I just noticed on the box that it's a Rev C. Anyone got a link to the Crybaby Rev C Schematic? And make a minute to show me where I'm testing with the multi-meter? 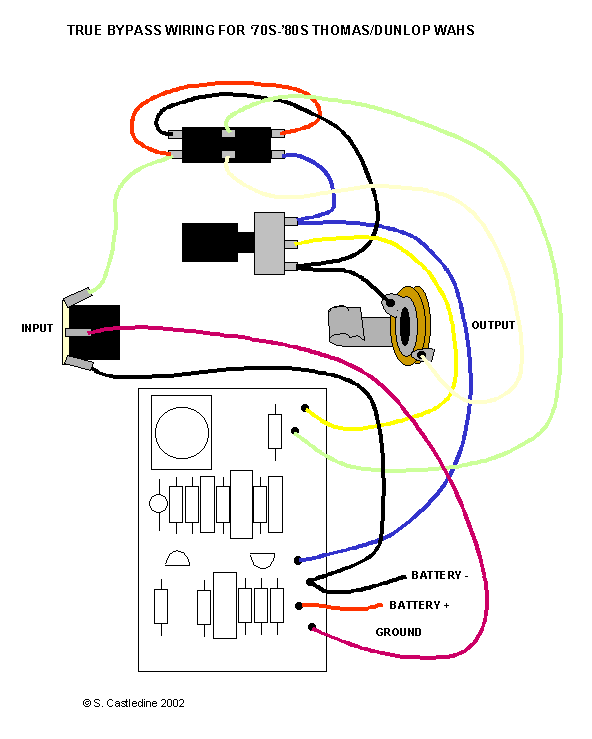 I found this diagram of what I believe to of a GCB-95 REV. C.
Which of the three connectors on the switch do I touch the red and black probes to? Bottom (black wire closet to output jack), middle or top? I understand that this isn't the stock wiring, but I'm pretty sure all the parts are the same. If you use the continuity check function, you test each wire at the one end and on the other one. You simply use the probes without regarding if it's the black or red one - doesn't matter in this case. 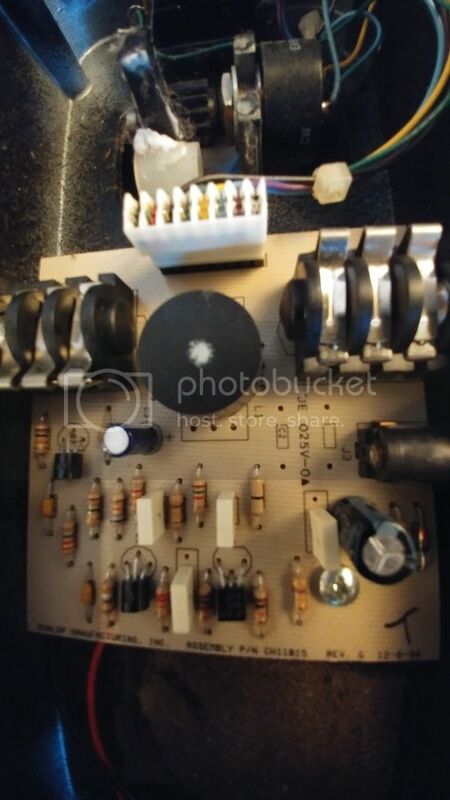 Is it possible for you to send a detailed picture of the circuit board (preferably the solder side) and the other components inside your wah pedal? That diagram isn't the right one, a stock rev. C doesn't have true bypass switching. Your switch should only have 3 wires on it. Green, purple and blue most likely. The green wire goes to the input of the pedal, if you measure between here and for instance the purple, your meter should read continuity. If not, press the pedal switch, it should have continuity now. If not, the switch is likely broken, it should switch between the 2 legs with the purple and blue wires. Posting a picture here is a good idea. Pepe wrote: If you use the continuity check function, you test each wire at the one end and on the other one. You simply use the probes without regarding if it's the black or red one - doesn't matter in this case. I need a 7/16" socket wrench to remove the input and output nuts to take out the board. I did spray D5 onto all the connections coming of the switch, as well as some other stuff that looked dirty. Still nothing. I'll be back with more pics once I've acquired the wrench. 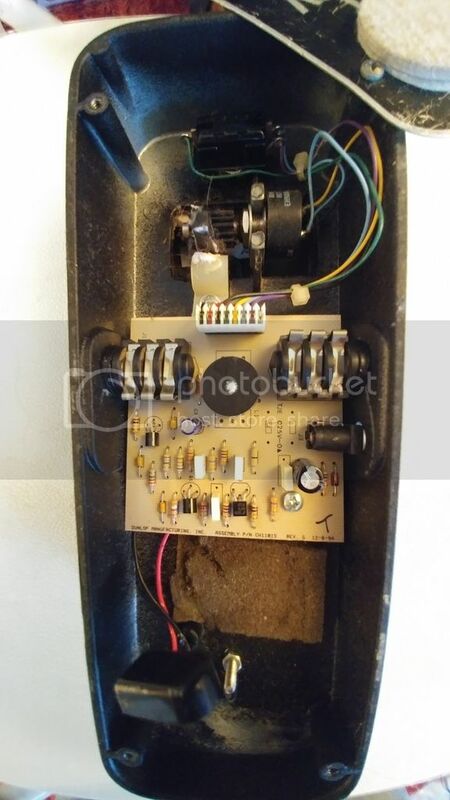 If I were you I would check with a proper power supply if the pedal still works. So far you have only tried it with batteries, right? If you apply too much tension to the battery snap and cord, it will break someday. I've seen that here and then. Pepe wrote: If I were you I would check with a proper power supply if the pedal still works. So far you have only tried it with batteries, right? If you apply too much tension to the battery snap and cord, it will break someday. I've seen that here and then. Ya, just the battery, but only cuz I don't have the proper power supply. Is there a way to test if the battery snap is working? If yes, how do you setup the multimeter for this test?